Some visitors to this stump on Hope Avenue in Passaic, N.J., say they can see the face of the Virgin Mary in it. THE scene is not welcoming: a sidewalk next to a rust-pocked overpass, across from a fenced, weedy lot. There, men in white suits fill Dumpsters near an old factory riddled with broken windows. Battleship gray clouds hang low, and the stench of exhaust sinks from the northbound lanes of Route 21 above. Here, the warmth of about 300 vanilla-scented votive candles reaches up to those who pray and place flowers, bills, coins, even a cough drop, near a hacked tree stump. The otherwise unimpressive trunk has become a sacred place, with some visitors saying they see the Virgin Mary’s face in the wood. 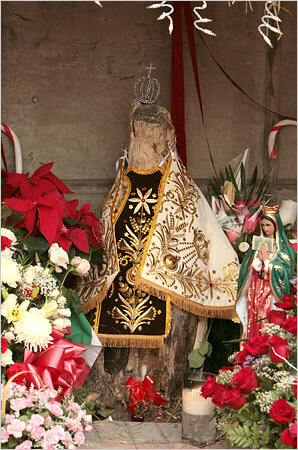 Here on Hope Avenue, the stump, wearing a silver crown and dressed in handmade white Peruvian vestments, stands in a manger engulfed in flowers. It is considered auspicious that the sign on the highway above the shrine reads “Exit 12.” The 12th day of the 12th month is the feast day of Our Lady of Guadalupe, the patron saint of Mexico. So a week ago, more than 400 people gathered at the shrine from 8 at night until 2 in the morning to worship. 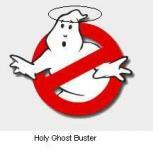 Some brought their baby boys in costume, with painted mustaches, dressed like Dieguitos, little Juan Diegos, a reference to the Aztec convert who is said to have seen the Virgin Mary on Dec. 12, 1531, in Mexico. “Are you not under my protection?” Mary is said to have asked Juan Diego, giving him roses in the deep of winter for a bishop who had balked at building a shrine to her. When Juan Diego gave the bishop the roses, it is said, a picture of Mary appeared on the bishop’s garment. Thanks to Passaic’s Mexican business owners, the space around the stump was rebricked recently, and lighting and fence posts were installed. A large mural is planned as well, said Jose Valle, one of the businessmen. “She’s the mother of all Mexicans, and we give her thanks for everything she happened to give us, that we finished the year in peace,” Mr. Valle said of the Virgin. “Am I not your health?” she is said to have asked Juan Diego. And so Passaic residents from a range of countries in addition to Mexico — Poland, Cuba, Colombia and Ecuador among them — bring winter roses with their prayers for good health. Teresa Guzman, in a white shawl and blue jeans, stopped by to give thanks for a recent checkup that found no further signs of the leukemia that afflicts her. Walter Batres, from Guatemala, came with his wife and sister-in-law, who has kidney disease, and presented his daughter, Guadalupe, 10, to the shrine.